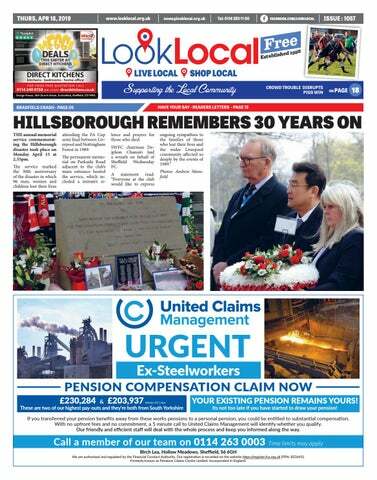 attending the FA Cup semi final between Liverpool and Nottingham Forest in 1989.
lence and prayers for those who died. YOUR EXISTING PENSION REMAINS YOURS! Its not too late if you have started to draw your pension! If you transferred your pension beneﬁts away from these works pensions to a personal pension, you could be entitled to substantial compensation. With no upfront fees and no commitment, a 5 minute call to United Claims Management will identify whether you qualify. Our friendly and eﬃcient staﬀ will deal with the whole process and keep you informed along the way. We are authorised and regulated by the Financial Conduct Authority. Our registration is recorded on the website https://register.fca.org.uk (FRN: 833645). Formerly known as Pensions Claims Centre Limited. Incorporated in England. DREAMS can come true as two local dancers have proved this week. Adam Roach, aged 13 from Burncross, has been awarded a place at Elmhurst summer school. Elmhurst is affiliated to Birmingham Royal Ballet and is one of the top vocational school in the UK. Terms and conditions apply, visit our website for more details. Dance at the Newton Hall in Chapeltown. The principal of the school, Melanie Pickering, described Adam and Beth as having the talent, the passion and the dedication to make it to the top. Adam and Beth with their fellow dancers will perform at Rotherham Civic Theatre in July. Gaining another hard-working councillor standing up for your issues in Sheffield Town Hall alongside our existing councillors Jack Clarkson and John Booker. Sending a message to the establishment parties that you are not happy with their performance. 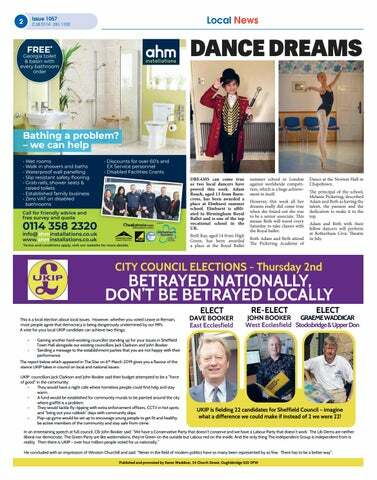 The report below which appeared in The Star on 6th March 2019 gives you a flavour of the stance UKIP takes in council on local and national issues: UKIP councillors Jack Clarkson and John Booker said their budget attempted to be a “force of good” in the community: They would have a night cafe where homeless people could find help and stay warm. A fund would be established for community murals to be painted around the city where graffiti is a problem. They would tackle fly-tipping with extra enforcement officers, CCTV in hot spots and “bring out your rubbish” days with community skips. Pop-up gyms would be set up to encourage young people to get fit and healthy, be active members of the community and stay safe from crime. UKIP is fielding 22 candidates for Sheffield Council – imagine what a difference we could make if instead of 2 we were 22! “We are delighted with our new conservatory as we can now use all year round and as part of the house as well as the garden”. DJ. ANDREW All your Favourite Hits - Request any song Plenty of amazing drink deals and offers!! GRAHAM LINDLEY All Acoustic covers past to present hits! Not to be missed great night!! 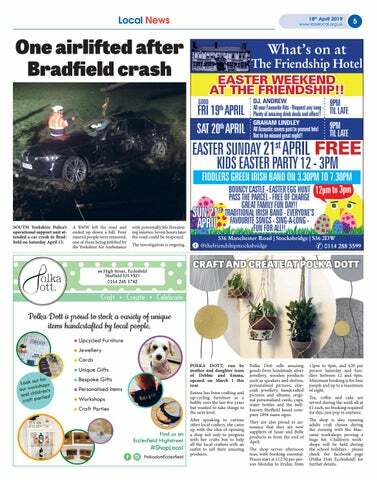 SOUTH Yorkshire Police’s operational support unit attended a car crash in Bradfield on Saturday April 13.
with potentially life threatening injuries. Seven hours later the road could be reopened. The investigation is ongoing. BOUNCY CASTLE - EASTER EGG HUNT 12pm to 3pm PASS THE PARCEL - FREE OF CHARGE GREAT FAMILY FUN DAY!! st TRADITIONAL IRISH BAND - EVERYONE’S SUN 21 FAVOURITE SONGS - SING-A-LONG APRIL FUN FOR ALL!! POLKA DOTT, run by mother and daughter team of Debbie and Emma, opened on March 1 this year. Emma has been crafting and up-cycling furniture as a hobby over the last few years but wanted to take things to the next level. After speaking to various other local crafters, she came up with the idea of opening a shop not only to progress with her crafts but to help all the local crafters with an outlet to sell their amazing products. 12pm to 4pm, and £20 per person Saturday and Sundays between 12 and 4pm. Minimum booking is for four people and up to a maximum of eight. Tea, coffee and cake are served during the week all at £1 each, no booking required for this, just pop in anytime. The shop is also running adults craft classes during the evening with the Macramé workshops proving a huge hit. Children’s workshops will be held during the school holidays - please check the facebook page (Polka Dott Ecclesfield) for further details. Oughtibridge planter competition THE Oughtibridge Millennium Group has launched a competition to design an exciting focal point for the centre of the village. REUNION WERE you a pupil at Burncross Infant School in 1959? Rosemary Bell (nee Jezusek) is trying to track down everyne in this photo for a reunion. The reunion takes place at the bottom Red Lion pub on Penistone Road, Grenoside on April 26 from 7pm. should be made on paper (up to A3 size) and can be in the form of plans, drawings, photographic montage or a combination of media. Each of the planters is 1.5m by 2.3m and stands 0.75m high. The most important factor is that the entry provides the judges with a clear understanding of what is intended. Entries should be sent to Phil Hirst, Oughtibridge Millennium Group, 11 Bedford Road, Oughtbridge S35 0FB by 31 May 2019. The competition will be judged by a panel including the OMG Chair, the Regional Development Officer of the Royal Horticultural Society, a Bradfield Parish Councillor and a representative of Amey plc. Full details of the competition can be found on the Oughtibridge Millennium Group Facebook page. able to afford their mandatory excess if the worst happened, and it’s also a great choice for savvy shoppers who want the freedom to lower their premiums by accepting a bigger voluntary excess – without the risks that normally brings! Looking for young drivers’ Excess Insurance? Insurers are especially hard on young drivers, often applying mandatory excesses as high as £2,000! Luckily, our cover comes with no age restrictions, so if you’re looking for young drivers’ excess insurance then you’re on the right site. If the worst happens, and you do have to make a claim, then our excess protection could save you making that humiliating trip to the bank of mum and dad! Excess Insurance has options for your car, home and business. As well as offering excess insurance cover for cars, motorbikes, multi-car policies, commercial vehicles, fleets, hire cars and taxi cabs, we even provide business and home insurance excess protection… Whether you’re a young driver, a not-so-young driver, a business or home owner Goodbye Excess really is your one-stop-shop for all your excess protection needs! 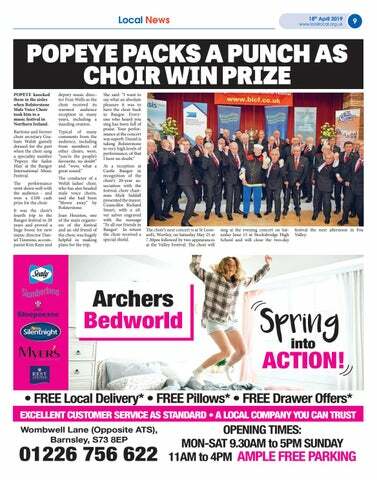 POPEYE PACKS A PUNCH AS CHOIR WIN PRIZE POPEYE knocked them in the aisles when Bolsterstone Male Voice Choir took him to a music festival in Northern Ireland. deputy music director Fran Wells as the choir received its warmest audience reception in many years, including a standing ovation. Baritone and former choir secretary Graham Walsh gamely dressed for the part when the choir sang a speciality number ‘Popeye the Sailor Man’ at the Bangor International Music Festival. The conductor of a Welsh ladies’ choir, who has also headed male voice choirs, said she had been “blown away” by Bolsterstone. Joan Houston, one of the main organisers of the festival and an old friend of the choir, was hugely helpful in making plans for the trip. She said: “I want to say what an absolute pleasure it was to have the choir back in Bangor. Everyone who heard you sing has been full of praise. Your performance at the concert was superb. Daniel is taking Bolsterstone to very high levels of performance, of that I have no doubt.” At a reception at Castle Bangor in recognition of the choir’s 20-year association with the festival, choir chairman Mick Siddall presented the mayor, Councillor Richard Smart, with a silver salver engraved with the message ‘To all our friends in Bangor’. In return the choir received a special shield. festival the next afternoon in Fox Valley. Scentsations by Amie Mens and ladies fragrances inspired by designers at affordable prices. TURTON Peacefully on 8th April, Wilf, aged 84 years. Beloved Husband of Clare, dearly loved Dad of Judith and Mark and loving Father-in-Law to Donna and a much loved Grandpa to Beckie, Aimee, Robert and Emma. Service to be held in Grenoside Crematorium’s South Chapel at 1.30pm on Thursday 9th May. Family flowers only please with donations if desired for the Palliative Care at Northern General Hospital (SHCT Fund No 5363), c/o Dyson Funeral Service, New Road, Deepcar. 0114 2883169. Hazel Mary WOODCOCK 18.04.32 As I look back with happiness and pride, Of those years we spent side by side, I will look up to the heavens above, And say Happy Birthday Hazel with all my love. Natalya had her foot of hair cut off at Yvonne and Keeley’s and now all the donations and sponsorship money has been collected. Natalya has raised a fantastic £372.37! Please would you print our heartfelt thanks to everyone who has supported Natalya by donating? Natalya and family. Thanks for donations after charity hair cut Thank you so much for featuring Natalya’s appeal in the Look Local, it helped generate interest and donations and we are very grateful for that. • Making a basic Will • Setting up Lasting Powers of Attorney • Protecting your home for future generations • Pre-paid Funeral Plans We know that planning for the future is a very personal matter. Not everyone is able or wants to travel to an appointment in town to sort out their aﬀairs. We can visit you at a convenient time in the privacy and comfort of your own home to discuss your unique circumstances. highest standards of conduct at all times. All our clients (and their families) that we have helped in the past have been very happy with our services and tell us they have gained great peace of mind knowing that they have sorted everything out. Do you want to witness democracy in action? Ten places are available to attend the count of Ecclesfield Parish Council votes for the election on May 2. Friday morning at 9am. Come see the democratic process up close and personal. Count will be held at the English Institute for Sport on Coleridge Road, S9 5DA. Publication subject to space and content. Publishing does not mean we agree with the content. As chair of the finance committee, I doubled the grant to Chapeltown Baths in order to keep it up and running. I would like to personally thank the volunteer management board that ran the baths for so long. I also instigated meetings with a building developer, the Planning Committee and local residents and got them to change their plans to appease the local residents. I fought to keep both Mortomely Lane care home open and to stop the building of Sainsburyâ&#x20AC;&#x2122;s on Wortley Road in order to save one of the oldest buildings in High Green. Once this review is finished the Council will update you of progress. Kind Regards, Susie Pryor, As per custom and practice, I recently bought a half Senior Transport Planner, dozen box of extra large eggs from Stocksbridge Transport, Traffic & Parking Services Co-op and upon cracking open two of them, I was consequently surprised to see that both of the said eggs had double yolks. see how â&#x20AC;&#x2DC;straightsâ&#x20AC;&#x2122; are formed. The solutions will be published here in the next issue. 7RFRPSOHWH6XGRNXÂżOOWKHERDUG by entering numbers 1 to 9 such that each row, column and 3x3 box contains every number uniquely. Similarly, a few days later, I repeated the process and once again found both eggs to have a double yolk â&#x20AC;&#x201C; as did the fifth one I cracked open for frying the following day. Thereby leaving me wondering (a) as to what the odds are against getting one egg with a double yolk, let alone five such from the same half dozen box and (b) whether or not the same hen would be responsible for laying them; and if so over what time scale. Hence I was wondering if any readers could shed any explanatory light. Kind Regards, We wish to thank all the kind people who came to Cllr John Brownrigg, our assistance on Friday April 5 at 6pm when my EPIC wife tripped over the large speed bump in the car 6 park behind Costa Coffee in Chapeltown. Also, thank you all for your cards, gifts and support we have received. Bill will miss each and every one of you, you are more friends than just customers. It is with deep regret that Bill has had to retire due to ill health. We both wish to say a massive thank you to all our customers for years of local support. â&#x20AC;&#x153;This will help us to better understand the concerns around this area and as a result, develop a scheme that takes into account the concerns raised during consultation as well as stopping further accidents happening.â&#x20AC;? How to beat Str8ts â&#x20AC;&#x201C; Like Sudoku, no single number can repeat in any row or column. But... rows and columns are divided by black squares into compartments. These QHHGWREHÂżOOHGLQZLWKQXPEHUVWKDW complete a â&#x20AC;&#x2DC;straightâ&#x20AC;&#x2122;. A straight is a set of numbers with no gaps but can be in any order, eg [4,2,3,5]. Clues in black cells remove that number as an option in that row and column, and are not part of any straight. Glance at the solution to see how â&#x20AC;&#x2DC;straightsâ&#x20AC;&#x2122; are formed. welcome, admission is £2. For more information please contact Maurice on 0114 2883482, or Margaret on 0114 2885037. 18 Hillsborough and Owlerton Local History Group - ‘The Roman Road Project’ by David H Ingliss, 7.45pm, Hillsborough Sports Arena, Hillsborough Park, S6 4HA, £2 for visitors, 2863017. Organising an event? 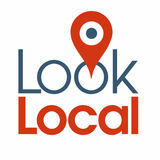 Tell us about it at news@looklocal.org.uk Publication subject to space and content. Friday April 19 19 Messy Church for Easter at St Mark’s Church Grenoside. Fun and activities for all the family including refreshments. Please come along to the church hall at 9.45am to 12 noon. Please note the change of time. Saturday April 20 20 Bradfield Village Hall, Bradfield Market - food, crafts and refreshments, 9am to 2pm, 2851227. 20 Bradflix Film Club, Bradfield Village Hall, Low Bradfield, ‘A Star is Born (15)’, 7pm, bar and refreshments, bring your own chair or bean bag if you wish, www.bradflix.co.uk Sunday April 21 21 Wadsley and Loxley Commoners - ‘Commoners Muck In Day’ - on the Common Heathland improvement, meet at Rural Lane car park, off Worrall Road, Wadsley, come along any time between 10am to 3pm, tools and gloves provided, 2348425. Wednesday April 24 24 Thurgoland Community Choir practice at 7.30pm. The practice will be at Crane Moor Chapel as usual. All welcome, no musical experience necessary. Contact Elaine on 0114 2845494 or Julie on 0114 2830613. Thursday April 25 25 Try “Singing 4 Fun” at Holy Trinity Church, Thurgoland, from 10.30am to 12am. Followed by refreshments. No auditions, no musical experience necessary. All welcome, contact Judith on 0114 2830083. Singing 4 Fun is a Dementia Friendly event. 4BL. Will last about two hours. 27 Waldershelf Singers Concert with Chamber Ensemble Rutters ‘Feel the Spirit’. 7.15 pm at Stocksbridge High School. Tickets available from Pauline 07752 638350 or Stocksbridge Keys or email Paulinewaldershelf@ gmail.com Adults £6, under 16s £3, under fives free. 27 Worrall Community Association Bring and Buy 11am to 2pm in the Memorial Hall, Towngate Road, Worrall. Free entry. Refreshments available. All proceeds towards supporting the Children’s Hospital and Worrall Gala. Contributions can be brought to the Memorial Hall on the day or dropped off in advance at Worrall Post Office or 286 Haggstones Road. 27 Outdoor Spring Market, Hillsborough Tabernacle, Proctor Place, S6 4HF. At the side of B&M Car Park. 10am to 1pm. Bargains galore, bric-a-brac, new items, toys, books, jewellery, good clothes and much, much more. Refreshments - bacon sarnies, yummy cakes etc. Come and join us. Tuesday April 30 30 Bolsterstone Village Hall ladies pampering evening and fashion show. Starts at 7.10pm with doors opening at 6.30pm. High Street labels and accessories at greatly reduced prices. Variety of beauty treats. Tickets £5, including pampering treats. Wine and refreshments available. Book early to avoid disappointment! Rita on 0114 2883803 or Carol on 0114 2882230. All proceeds to Bolsterstone Village Hall. Wednesday May 1 1 Thurgoland Community Choirs practice. 7.30pm. The practice will be at Crane Moor Chapel as usual. All welcome, no musical experience necessary. Contact Elaine 0114 2845494 or Julie 0114 2830613. Thursday May 2 2 The launch of Hillsborough and Owlerton Retale, four cine films converted to DVD 1930s to 1950s. With a small grant from the lottery. 7pm at the Hillsborough Sports Arena, Middlewood Road, S6 4HA. Telephone 2863017 or 2349371. Saturday May 4 4 Jumble sale 10am, Salvation Army, Victoria Street, Stocksbridge. Singing by Heart (social time and singing) for people living with Dementia and their carers. 4 Sheffield Wildlife Trust - Join ecologists and nature enthusiasts for a day of family friendly wildlife surveys at Wadsley & Loxley common! A Bioblitz is a fun way to learn about your local wildlife while helping to gather important biological data. Events include guided walks and ecological surveys and will run throughout the day, culminate in an evening bat walk from South Yorkshire Bat Group. Please see www.wildsheffield.com/whatson/ for further details of events and times. Free event – 9am to 3pm. Bat walk 8.50pm. 4 10am to 1pm - Christian Aid Coffee morning at Stocksbridge Christian Centre. Various stalls and light refreshments. All proceeds to Christian Aid. PC Repair, Network Or Internet Problems? Reliable Local Family run Appliance Repair Service based in S36. Garden Help Experienced and qualified Gardeners offering quality regular or one off garden maintenance at competitive prices. â&#x20AC;˘Driveways â&#x20AC;˘Decking â&#x20AC;˘Patios-paving â&#x20AC;˘Conservatories â&#x20AC;˘Graffiti Removal and much more. â&#x20AC;&#x153; Your peace of mind is our businessâ&#x20AC;?. PROBLEMS WITH CONDENSATION BETWEEN YOUR DOUBLE GLAZED UNITS? •	Tumble dryer, proline condenser, immaculate condition - £60 ono. Punchbag, good condition - £35 ono. Banana garden umberella & stand - £25 ono. 07549 357 121. •	Kenwood Chef-De-Luxe stand mixer with all attachments - £50 - Tel: 07900 204 558. •	Golf trolley, bag, clubs and 60 balls £60. Additional golf bag - £15 - 0114 2862469. •	Claud Butler Urban 500. 16” (40cm) Frame. 24 Shimano gears, Twist Grip changers (spare lever changer) Immaculate condition. £195 - 07777667337. •	Black oval TV stand, glass shelf and CD drawer. As new condition. Tel: 0114 288 8616 - £55 was £300. •	Quality Hench BMX, age 13/14+, excellent condition, bargain at £100 - 0114 288 2555. •	Quality mahogany fire surround complete with marble back plate, hearth and electric fire - £50 - Tel: 07773 024 294. •	Sharp microphone 800w - £25 as new - 0114 246 6850 - buyer to collect. •	Brand new good quality wool carpet, hessian backed, slate grey. 10ft x 4ft long. 7ft x 10ft wide. £45. 07833508128. •	Childs wooden kitchen with utensils and food, as new £20. Large Cane Box of duplo lego £30. Pirate ship £5. Castle £5. 2 tanks with action men £15 all as new 07811 307673 buyer to collect. •	Beautiful John Lewis Mirror, as new £20. Small John Lewis Chandelier, as new £20. 2 Sony Speakers on stainless steel stands, as new £15. Carved Hall Table £20, first looker will take. Buyer to collect 07811 307673. •	3 Mirrored Sliding Doors with full tracking to fit dormer roof. Each door measures 47” high x 34” wide. Excellent high quality. Collection only £30 - Tel: 07973 918 880. •	3 Mirrored Sliding Doors with full tracking to fit dormer roof. Each door measures 47” high x 34” wide. Excellent high quality. Collection only. £30. Tel: 07973 918 880. •	Walking sticks for sale. Holly, ash, hazel, black thorn, horn or wodden handles, carved or plain Phone: 283 0093. Kitchen area, separate cloak room / WC. Partly furnished, newly re-furbished. Let as one unit or split into two. 70m² total. WAR MEMORIAL SIGN OFF IN STYLE WITH A WIN Intake Old Boys 1-4 Oughtibridge WMFC OUGHTIBRIDGE War memorial signed off for the season with an impressive 4-1 victory away at Intake. It didn’t start start well for David Hudson’s men with a Connor Schofield cross allowing Elliott Coles to give the home side the lead. Both sides were then reduced to 10 men after an altercation between two players resulted in keeper Kieran Osborne been sent off. score. Turner then struck the bar with a 30 yard strike but ten minutes before break Wilson Coupe played a great cross field pass to Adam Thomas and he smashed Oughtibridge into the lead. Intake then took risks in the second half but it backfired as Oughtibridge went close several times and it was only a matter of time before Wilson Coupe added Oughtibridge’s third before Harrison smashed home his second on the volley from Chas Tunnard’s cross to complete the scoring. COLD and windy weather didn’t deter members of Birdwell Wheelers last weekend. Club president Christine Minto completed a solo 65mile loop to Selby and was glad of the tailwind home. With an early start on a cold and windy day his time of 1h 6m 45s was also a new club age record at 65. Sunday saw eight Wheelers set off on the club’s annual 100 miles in eight hours reliability ride. The previous day John Woodhouse rode the 103km ‘Charnwood in the Spring’ Audax setting off with 180 riders from Trowell through Stapleford, Kegworth, Mountsorrel, Sixhills, Sawley and back to Trowell, Woodhouse climbing 750 metres over the course of the ride and finishing well within the nine-hour time limit. Dave Scargill completed his first road race of the season in the LVRC’s Percy Stallard series. •	Old wood and brass fishing reels. Please phone Jay with details. Good price paid. Also air guns - 07518 938 321. •	Old Sheffield Langsett Bicycle - just a frame would be considered. 07464939521. Roger Bacon, Paul Mynett, Trevor Mayne, Dave Hudson, Phil Adams, Marc Peasegood, Austin D Watson and Sally Salter set off from Brewers Fayre roundabout Wombwell. Unfortunately, Roger Bacon had to return home with a mechanical but chased back onto the main group. Paul Mynett and Trevor Mayne took a short cut home at Pontefract. The café stop at Howden broke the journey and a tailwind made for a quick return journey. On Saturday, Wheeler Trevor Mayne rode in the BDCA 25 mile time trial on the A50 at Etwall. His time of 54m 09s was a new club age record at 55. On Sunday Paul Heggie rode in the VTTA(Yorkshire) 25 mile time trial at Topcliffe. OUGHTIBRIDGE grafted hard to come away with all three points from their long away trip to Kettering Town where they came up against former players Camoly Liburd and Sami Jones. On 28 minutes they got their noses in front, a high cross from the right wing evaded everyone apart from skipper Kathryn Mudge who ghosted in to score a brilliant volley into the bottom corner. In the final moments Development team player Chelsea Wall scampered through to calmly lob the Kettering keeper for her first goal at this level and cap off a fine individual and team performance. The home side looked the more likely kicking with the breeze in the first half and spurned a decent chance to go in front but then a superb tackle from Abigail Towns to stop leading scorer Laura Becket set the tone for the game as Oughtibridge started to get a grip. The second half was more comfortable but whilst ever it was only 1-0 Kettering remained in the game and showed their intention by playing three up front. A number of good chances came and went for the War Memorial Ladies who were then grateful for Coran Wright’s brilliant block late on. Next up for the WM Ladies is a home game against Woodlands Ladies FC on Wednesday April 24, 7.45pm kick off at the home of Stocksbridge Park Steels, Bracken Moor, all support for this game will be most welcome where there will be a small admittance charge on the gate. ure in crowd control and then any sanction will be at the discretion of the South Yorkshire Rugby Union. Five un-named Stocksbridge Rugby Club members will appear before the club’s disciplinary committee to explain their part in the unsavoury scenes. Until that moment, Stocksbridge had edged all aspects of the game and built up a match winning score thanks to a Scott Bowskill penalty and tries by Andy Beal, Pete Newton and a brace by Liam O’Leary. Stocksbridge must now await the result of the other semi final between Yorkshire Main and Wath seconds to learn who their opponents will be in the final scheduled for Wednesday April 24. The Fox Catering man of the match went to prop Gary Woodcock, sponsored by Chappell Brickwork & Plastering Services, for an impressive and aggressive all round display. SHEFFIELD Speedway Tigers’ league opener ended in defeat as they went down 52-38 at Newcastle on Sunday. gers responded instantly with a maximum of their own from Tactical Substitution Kyle Howarth and winter signing Danny King. and Brent 3-28. Elsewhere on the fells Steve Sanders and Myfanwy Cross competed in the Peat Pit Woods Fell race. Steve placed 19th in a time of 20-36 and Myfanwy was 62nd in 26-28. First back was Lee Nash in 53rd place in a time of 1-21-22. Lee was closely followed in by Charlie Skipper (1-22-16) and veteran Martin Ball (1-22-24) who were both inside the first 100 finishers. A good number of Penistone runners competed in the challenging but popular Sheffield Half Marathon. Many achieved personal bests in the cool but run friendly conditions. First lady back for Penistone was Jill Carlton in 1-47-27. Bryan Harrod guided a visually impaired runner round to finish in 1-45-56.
finish in second place in a time of 18-05. Lee’s father Steve finished in 12th in 21-51 whilst under 12 youngster Joseph Storey was third in the under 12 category. Julia Johnson claimed 2nd lady over55 at the Vale of York 10 mile race in a time of 1-10-14. Hannah Butcher (1-15-40) and Mark Graham (1-17-09) also took part. First full busy week of the summer at Stocksbridge Golf Club WITH the summer season just two weeks old, the number of competitions over the last seven days is now up to full steam. The first competition of the week was the Dragons mid-week Summer Cup on April 10.
the former took third place with a better back nine score. The gents section played its first mid-week competition, a stableford on April 11. A small field competed and S. Coutts (10) won with 38 points, ahead of C. Dale (4) on 26 points. ley Miners Welfare 3-1 in front of a crowd of over 200. 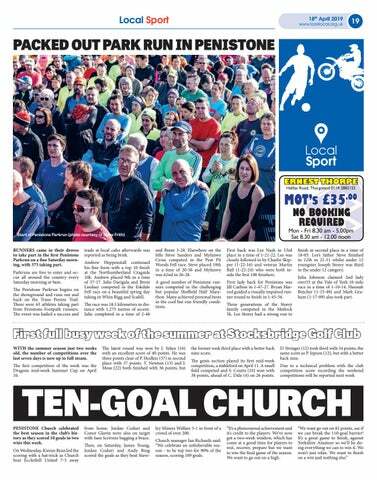 Church manager Ian Richards said: “We celebrate an unbelievable season - to be top two for 90% of the season, scoring 109 goals. “It’s a phenomenal achievement and it’s credit to the players. We’ve now got a two-week window, which has come at a good time for players to rest, recover, prepare but we want to win the final game of the season. We want to go out on a high. STOCKSBRIDGE Park Steels will once again compete in the EvoStik League next season after a 1-1 draw away at Carlton confirmed their survival. Steels have had a tough season but turned things around with three wins on the bounce lifting them clear of the relegation zone. A goal from Danny Frost after just five minutes proved to be enough to earn a point and make it mathematically impossible for them to be sucked back into the drop zone. This Saturday, Steels host Lincoln United at the Look Local Stadium, with a 3pm kick off.